Denise Nicole Designs, LLC was established in 2012 by a mother and daughter team, Cheryl and Candace Marsh. The business sells handmade jewelry, crafts and accessories made in the USA. Both Cheryl and Candace enjoy working with their hands to create beautiful one-of-a-kind products. " Together we have years of experience providing quality customer service and knowledge of our craft. Like other artists we are truly passionate about our creations that bring a sense of joy and satisfaction to every customer we meet." Cheryl Marsh is the co-owner of Denise Nicole Designs, LLC where she creates crafts and accessories. 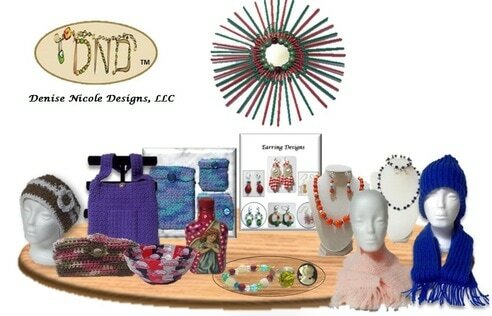 She has made handmade crafts and accessories for over 20 years and has pursued degrees in Business, Business with E-Commerce, Human Services Technology and lastly in Digital Media Technology, which are all centered around the business. ​Candace Marsh is the co-owner and jewelry designer at Denise Nicole Designs, LLC. She has been designing and creating jewelry for a total of 14 years. Her degrees in Fine Arts, Digital Media Technology, Office Administration have been centered around her craft and she contributes to the overall operation of the business. Denise Nicole Designs, LLC's sole purpose is to sell affordable handmade jewelry, accessories, and arts & crafts. We create and design our quality products all made in the USA; that our customers want, use and cherish on a daily basis. Denise Nicole Designs LLC, was born out of a passion for creating, designing and just wanting things to be different. So with a combination of mother and daughter, Denise Nicole Designs was formed. We design one of kind products made in the USA , that can be used as a gift for any occasion. In our eyes every day is special to someone. We do our own handmade work so each item created will always be original. Our company is passionate about all of the hard work that we dedicate to our handmade designs, and we really feel that the extra mile taken towards each design is worth the effort. Most of all we enjoy what we do and hope you will consider becoming a recipient of our products. Denise Nicole Designs, LLC has a wide variety of products for sale. A well rounded jewelry line which consists of many unique styles of Earrings, Bracelets, Necklaces and Rings made from different mediums.The crafts line is extending daily with new ideals. Some of the present designs are Mirror and Framed wall hangings, Paper-Mache bowls, Embellished paper bowls, Art Deco glass jars and bottles. Our Crocheted accessories, handbags and headbands are an all time favorite. The seasonal line consists of Knitted & Crocheted hat and scarf sets, shawls, and single scarves that are fun to accessorize with your wardrobe during those cold winter months. The video below will showcase our products and company outlook as Denise Nicole Designs, LLC.